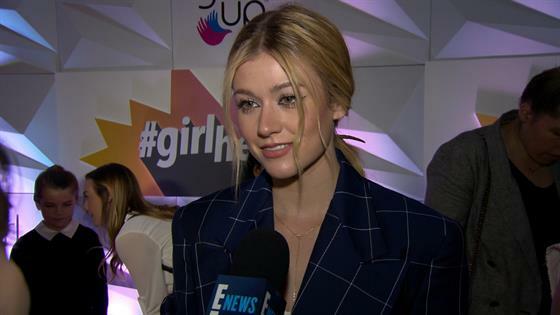 Katherine McNamara knows that she has her fans to thank for becoming an E! People's Choice Awards finalist this year. In fact, her fans proved their dedication as Shadowhunters: The Mortal Instruments lovers by writing her name in during the nominations round of the 2018 People's Choice Awards in order to secure her spot in the finalist round for Female TV Star of 2018. In addition to the 22-year-old actress' finalist nod for playing Clary on the Freeform series, Shadowhunters is also up for Show of 2018, Bingeworthy Show of 2018 and Sci-Fi/Fantatsy Show of 2018 at this year's award show. Her co-star Harry Shum Jr. secured his own write-in finalist spot for Male TV Star of 2018 as well. That is some serious love for the Freeform favorite and McNamara doesn't take the honor lightly. "That's been the biggest gift. This People's Choice surprise," McNamara told E! News at the #GirlHero Award Luncheon Presented by Girl Up on Sunday in Los Angeles. "It's been a real roller coaster. It's quite a bit of shock when you find out this is happening. But ultimately, I have nothing but gratitude and love for the Shadowhunters fans," the Missouri native continued. "They have done so much for us especially with the show coming to a close," McNamara noted. "It's really a testament to another group of people coming together to support a story that is about love and acceptance and it shows how amazing the Shadowhunters fans are." Clearly the Shadowhunters fans have spoken, but have you voted? The final round of voting closes this week, on Friday, Oct. 19, which means you only have four days to get in all your votes, so you better get moving! Don't miss the 2018 People's Choice Awards airing live from E! on Sunday, Nov. 11.